Butcher and Reliable Market owner Bob Pacheco at the office. Announcement: The topic for this week’s Off the Menu column is steak. Those of you who feel like you need to start laughing now, go ahead and get that out of the way. Just because your columnist is a vegetable enthusiast (for lack of a better term) does not mean she isn’t interested in all things edible, all things Island, and especially anything that might be able to go on the grill and feed a lot of people. If you know Bob (and you probably do), you also know that he is a kind, patient man, willing to cut you some extra steaks, order you something special or offer a cooking tip or two. 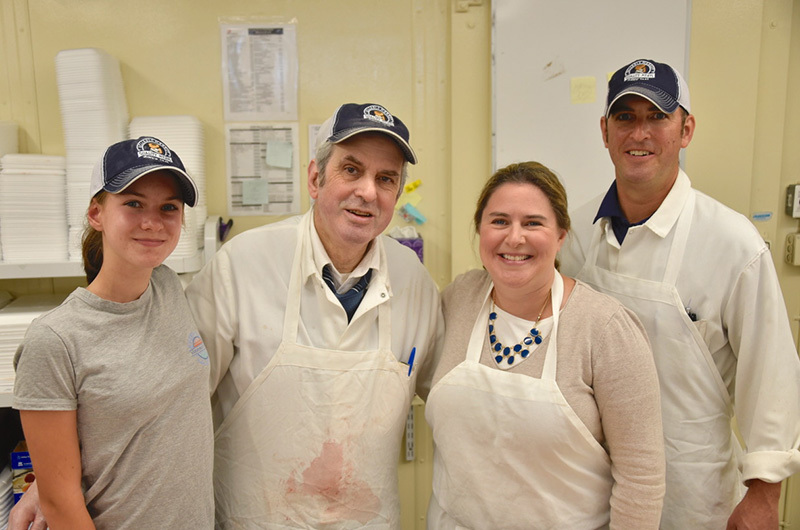 Now picture me with photographer Jeanna Shepard, hanging out on a busy summer morning with Bob, trying to stay out of the way as he cuts and packs meat and takes a good bit of ribbing (pun intended) from the family members who work in the Oak Bluffs store with him. His daughter Jennifer Freeman comes in while we’re asking him about which family members are co-workers. “Don’t forget your granddaughter Katie who’s standing right over there!” she laughs. Son Eddie, who also cuts meat and manages specialty cheeses and deli meats, smiles as we drag him in for a photo. We ask Bob how he keeps his even temper. “What, you want to come here and see me in a bad mood? Who wants that! You just take one customer at a time and do the best you can,” he says. We watch Bob cut rib-eye steaks from a rib roast that could just as easily be your Christmas dinner as it could be the source for amazing steaks. Rib-eyes are Bob’s favorite steaks for the grill, he admits reluctantly, not wanting to play favorites. But I press him on this because I want to know which is the most flavorful steak for the money. “Tenderloin is definitely the most tender meat, but not the most flavorful,” he points out. Sirloin strip steaks (also known as New York strip) are more flavorful but a bit less tender. If you want the best of both worlds, go with Eddie Pacheco’s favorite cut, the Porterhouse steak. On one side of the bone is tenderloin, on the other side is sirloin. Sirloin strip steaks are cut from the short loin, which is located behind the ribs. Rib meat is fattier than sirloin hence the flavor advantage of rib-eyes over strip steaks. • Rib-eye steaks are well-marbled and cut from the ribs. They offer superior flavor and good texture for steak lovers. Available bone-in and boneless. • Tenderloin steaks: most tender steak of all, always boneless, but lean meat requires medium-rare cooking. • Sirloin strip steaks or New York strip: cut from the short loin, nicely marbled but leaner than rib-eye, good flavor and moderately tender texture. Also best cooked medium-rare. • Porterhouse steak: bone-in cut that includes a piece of tenderloin and a piece of sirloin (from the short loin area); great flavor. Nicknamed the King of Steaks. To my mind, these steaks should only be seasoned simply before cooking and should not be marinated. “You want to taste the flavor of the beef, not mask it,” Bob and Eddie agreed. If you want to do something more than salt or pepper, a spice rub would be fine, but otherwise I’d add any additional flavor after cooking. Sauces that are great with grilled steaks include herb butters, warm salsas, sautéed chopped mushrooms and shallots deglazed with red wine, traditional fresh green sauces like chimmichurri, salsa verde or mojo, or even a topping of a light and spicy green salad like I’m suggesting in the recipe. But what about those other steaks we hear about, eat in restaurants, or might be cooking with at home when we can find them: skirt steak, hangar steak, flat iron steak, top sirloin steak, and, of course, the familiar flank steak. These are all flavorful steaks, but they mostly come from well-used muscles that tend to be less tender. They require some attention if you want a tender result. • Skirt steak is amazingly tasty and super-quick to cook. 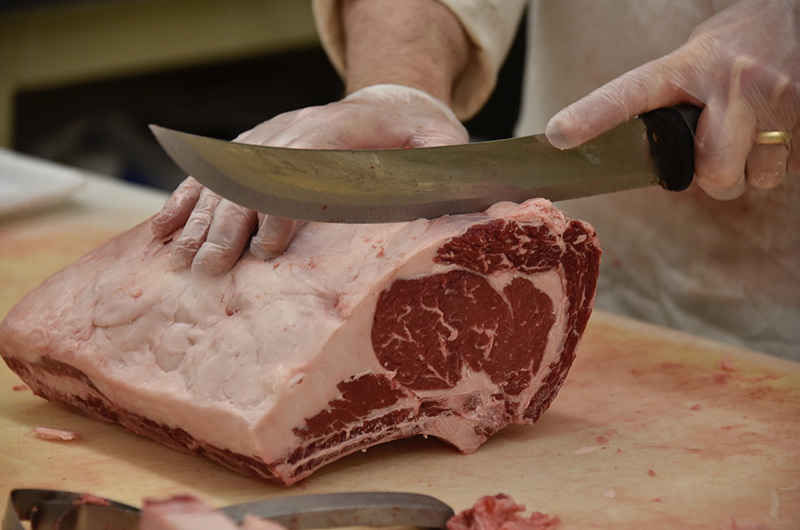 The only problem is that demand is high, supply is low and that drives the price up — as much as $6 more per pound than rib eye, Bob reports. But if you do find it, feel free to treat it however you like (marinade, rub, sauce, etc.) as long as you’re sure not to overcook it and you slice it thinly. Skirt steak is the traditional choice for fajitas. Bob can order it for you if he doesn’t have it in. • Flank steak has the same supply and demand problem that skirt steak does, because there are only two flanks per cow. Some restaurant chains are willing to buy up a lot of flank steak at top dollar, which leaves supplies even lower and prices higher. But if you want to spend the money, one flank steak will feed a family, and it’s a delicious cut that benefits from an overnight marinade (especially one with ginger, garlic, brown sugar and soy sauce). Because of the structure of the muscle, it must be sliced very thinly against the grain. • Top sirloin is an excellent steak for the budget-minded. It has good flavor and texture, is big enough to feed two (even two and a half) people and is easy to grill. It reminds me of something Fred Flintstone would eat, though I realize that doesn’t necessarily sound appealing. You’ll have to trust me (or the me from my formerly regular meat-eating days) on this one. Try it. • Flat-iron steak. Bob recommended this cut for the budget-minded and said that it really is great for the price. Cut from the shoulder blade (which is actually part of the chuck in the front of the cow), it is lean but relatively tender and flavorful. Look for flat iron steaks that don’t have a visible line running down the middle of them. • Hangar steak has gotten increasingly pricey, because there is only one of this little-used muscle per cow, and the extremely beefy flavor and tender texture has really caught on with foodies. While Reliable doesn’t carry it regularly, if you want to try it, Bob is happy to special order it for you. To grill any of these steaks, be sure to follow the grilling tips listed below. to be perfect and don’t get discouraged. The more you cook on your own grill (and as long as you pay attention and don’t walk away to do something else! ), the more success you’ll have. Here are a few tips for grilling steak. Preheat your grill so that the grates are really hot to begin with. (Drop the temperature to medium-high once you put the steaks on.) Clean and oil the grates. In a gas grill, keep the lid down and the heat convecting at all times. If your steak is between one and one and a half inches thick, you can do most of the cooking directly (usually about five to six minutes per side for medium rare, though skirt steak only needs a few minutes per side); if your steak is thicker than that, you might want to finish with indirect heat — meaning you would move it over a burner that is shut off or on very low (or not over coals on a charcoal grill.) The remaining burners keep the temperature hot enough to finish roasting the steak, but the exterior won’t get overcooked. Always let your steak rest for at least five minutes off the grill. If you cut into the steak right away, juices which come to the surface when cooking will spill out and make the steak dry. The resting time allows juices to redistribute. Recipe for Summer Greens Salad with Steak, Shallots and Blue Cheese. You're killing me here!! All I want is steak all day, every day now!! Thanks for the tips. Learned more here about steaks, than watching any cooking program. Great article (as I try, mostly unsuccessfully, to eat more vegetables), but where is the picture of Donna, proud mother and grandmother? With due respect to Bob and the offspring, I doubt anyone would be there if it weren't for Donna! Great Guy. Great place to shop. 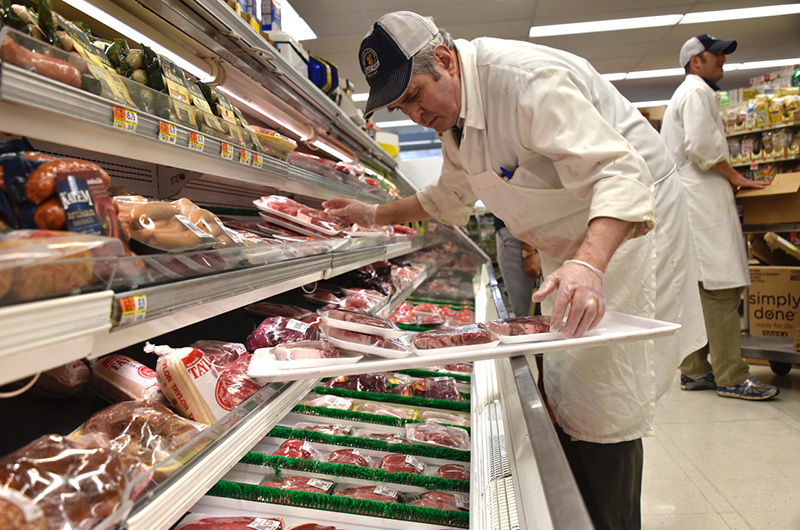 Everytime we need a great cut of meat for a party or holiday, Bobby is the go-to man. Such a gentleman and always, always willing to help. He makes us feel like we have our own personal butcher and we have never been disappointed in the meat he cuts for us. Bobby is just an all-time nice man, and is an expert in his craft. Thank you for highlighting the epitome of a special Vineyarder! Absolutely adore this store and this family!